Planning on a water pumper engine swap for my 914, and I see most of the radiator mounts involve cutting the hood or venting air outwards someway involving that. I already have the floor cut for factory A/C (not there any more and don't plan on keeping A/C with the engine swap), and I was curious if I could mount a radiator horizontal, and direct air out of the bottom of the car. I know this will cause lift, but I'm unsure how much it will cause at speed, and if it will actually be an issue? I'd like to maintain as much as my trunk as I possibly can, that's why mounting it 100% horizontally is appealing to me. Most car radiators are not designed to be run horizontally, you won't get the desired water flow and trapped air will be a major problem. Look up "Renegade Hybrids", they have done water-cooled conversions since forever and their radiator setup simply works. Same with okieflyer with his Honda conversion. I used a radiator and fans out of 924. Inlet is the 916 oil cooler hole" fiberglass front bumper" made ducting with aluminum and exited out hole in hood. Runs too cool going down highway never overheat even in Los Angeles traffic. But mine has a SR20DET in it. Not too keen on idea of cutting tub. And it only ways 1800 lbs so power to weight ratio is excellent. I used a radiator and fans out of 924. 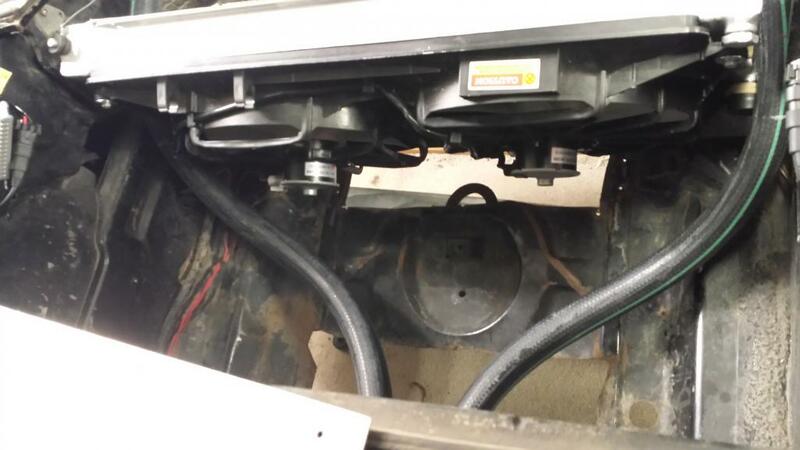 Inlet is the 916 oil cooler hole" fiberglass front bumper" made ducting with aluminum and exited out hole in hood. Runs too cool going down highway never overheat even in Los Angeles traffic. But mine has a SR20DET in it. Not too keen on idea of cutting tub. And it only weighs 1800 lbs so power to weight ratio is excellent. Mine exits out of the A/C hole in the floor. Good cooling, sometimes too much on the highway. I'll look for pics later. Can't say if it lifts or not, all I know so far is the rear end floats at 120mph. I think part of that is airflow thru the engine compartment since it's not sealed anymore. But mine has a SR20DET in it. Not too keen on idea of cutting tub. And it only weighs 1800 lbs so power to weight ratio is excellent. Another Nissan (IMG:style_emoticons/default/aktion035.gif) I've got the VQ30de, with a VQ35de "upgrade" in the garage. I had this in my first 914. I took a Ford van radiator and had the shop mount 90 degree fitting of the water inlet/outlet. I had them ad a long tube for the cap that stuck up almost to the hood. This is the high point fill. I built a platform at about the bumper top height and carpeted it. Air flowed in from the bumper, under the platform and through the radiator. I had a large single fan pointing down to pull air out. 1) Worked great for cooling and allowed me to have a little front trunk space. 2) On a dirt road the fan would blow dust all over the place and into the car. 3) In traffic, the hot air blowing out from the bottom of the car would make its way into the windows and cabin if they were down. 4) This adds air under the front of the car which will make it more unstable as speed increases. 5) I would do this again if I could devise a duct that pulls the air out to the side of the car. 6) My front mounted Celica GTS radiator works much better than the flat radiator from the past. I'm glad I received more than a no. Now I have another curious question: About how hot is the air leaving the radiator? What if the air came IN from below and was routed towards the front calipers, would this be too hot to cool them? Maybe I'm over complicating this, it's just a curiosity at this point. First off we need to know how big of an engine your looking for. If its a v6 or 4cyl turbo you can run a Celica GTS radiator and have a VERY clean install. If its a v8 you might have cooling problems and need to go with something else. For mounting, there are LOTS of threads. But your desired engine is critical to know. I measured this once a few years ago, it's little, like 30f over ambient. If you think about it, all front engine cars have the rad air blow on the engine and they are strictly cooled at 180-212f. Plus it doesn't blow directly on the brakes, it exits into the wheel house which is a high turbulence area. The motor will be a Subaru 4 cylinder motor, so I'm sure not nearly as big of a radiator will be required as a V8 would. The first subaru motor I installed in my 914 was a 2.5L four cylinder EJ253. To be honest it was okay. It was more power than the stock type 4 but the acceleration was still a bit uninspiring. I would routinely get spanked on the freeway on ramps by aggressive soccer moms in mini vans. Must have been something wrong with your engine.. I raced a fellow member with my v8 conversion who had a bare bones 2.5, it was a surprisingly close race till about 70 when I pulled away. My car was making about 240 whp then. However I agree that any of the Subaru 6s is a solid choice. Either of these engines will do just fine with a Celia GTS radiator. There are 3 or 4 good writeups on it. I know myself and Mike Bells have one in our building threads. Planning on a turbo EJ20 from Japan, with ~275 hp stock, should push 300 NO problem with a tune, I think I will get in more than enough trouble with that, lol.